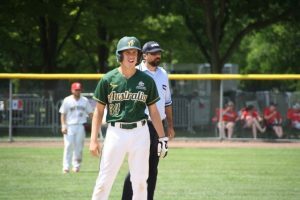 New sports: Blake Jackson, one of many South West Sydney Academy of Sport softball athletes with their eyes on the Tokyo Olympics, playing for Australia last month during the U19 World Championships in USA. Australia defeated Mexico 5-1. The dust has hardly settled on the Rio Olympic Games but the South West Sydney Academy of Sport says local athletes are set to make a big contribution to Australia’s next campaign. The academy says our region has a strong presence in at least half of the six new sports that will be added to the Tokyo Games in 2020. The three new Olympic sports we excel in are softball, baseball and karate, according to the academy. The other three new sports are skateboard, climbing and surfing. Academy executive director Gerry Knights says the new sports are an “inventive combination of youth focused and established events, which are also popular in Japan and will positively add to the legacy of the Tokyo Games’’. “With the 2016 Rio Olympic Games results still in the minds of most Australians, the South West Sydney Academy of Sport hopes the success of its 2016 Olympic athletes will inspire the next generation of Olympic and Paralympic champions in waiting, to strive for Tokyo selection,’’ Mr Knights said. “These new sports will provide young athletes the chance of a lifetime, to go for their dreams of competing on the world’s greatest sporting stage. “And in doing so hopefully inspire them to achieve their best, both in sport and in life. Mr Knights said current and past academy athletes in Australian age category teams include Gabrielle Plain, Chantelle Ladner, James Toddhunter, Harrison Peters, Pete Wards, Chris Gillies, Blake Bell, Izack Rossi, Luke Ollerenshaw, Henry Groth, and up and coming stars Blake Jackson and Jorja Barrett. A passionate supporter of our Olympic athletes, Mr Knights said we should be very proud of our Rio team. “I’d also like to wish our region’s Paralympic athletes well as they finalise their preparations for the 2016 Rio Paralympic Games,’’ he said. The Paralympics start this Wednesday, September 7 and will conclude on September 18. The culmination of the 2016 Olympic Games comes at an important time for the South West Sydney Academy of Sport, with many of its sports programs currently open for nominations. The academy is currently calling for softball, basketball, tenpin bowling, individual Lone Star athlete, Para Sports athlete and rugby league nominations. Netball, swimming and triathlon have now closed, with golf, hockey, AFL and new sports opening soon. To nominate visit the academy website by clicking here or call 4627 7622.